The Sandy Creek Junior Varsity (JV) Cheerleaders took first place at the West Genny Sweetheart Classic on February 1. 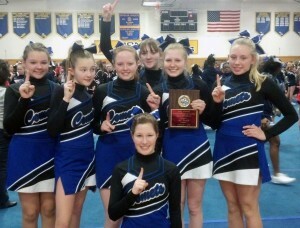 Sandy Creek JV Cheerleaders with their first place plaque at the Sweetheart Classic. Pictured following the competition with their plaque are: in front kneeling: Kim Distasio. Standing, left to right: Angelina Salzman, Trisha Joy, Mikayla Russell, Dallas Blair (back), Jessica Leppien and Lexy Ladd. The team, coached by Rachel Paige, took home their first competition first place award.